Fifty-two years after Dolores Huerta negotiated the United Farm Workers union’s first successful collective bargaining agreement, Teresa Romero will become the first woman to serve as its president. Romero, 60, will take over the job when the current president, Arturo Rodríguez, steps down in December. She becomes only the third person to hold the job. Before Rodríguez, the late civil rights leader César Chávez served as the UFW president. The UFW said Romero is the first Latina and first immigrant woman to head a national union in the United States. Originally from Mexico, Romero came to the U.S. on a temporary visa and stayed. The 1986 immigration bill signed by President Ronald Reagan allowed her to become a legal resident and eventually a U.S. citizen. Romero said she takes over the UFW with the union in a position of strength, even though membership in unions has been on the decline. The union won protections from heat illness for all farmworkers in California. They now have the right to clean and cold water, to take breaks and to take them in shade. It also has been able to secure overtime for farmworkers in the state. It is working to secure those rights for farmworkers nationally. The union has been able to win pesticide protections for farmworkers nationally, she said. Although UFW membership is largely in California, Washington and Oregon, its larger goal is to get immigration reform legislation through Congress and signed into law, Romero said. Born in Mexico City, Romero moved to Guadalajara, Mexico, when she was 4. Her father worked for a company that manufactured tortilla making machines and her mother was a stay-at-home mother. One of six children, none worked as farm laborers. “My father worked very hard to put all of his children through school,” she said. Her siblings and father all eventually joined her in the United States. Romero previously owned a construction management consulting business and had managed a law firm that helped workers with immigration and workers compensation claims. But after assisting farm workers, “they win your heart,” she said. She is now UFW’s secretary-treasurer and chief administrative officer. The union said she ran fundraising that collected $1 million, money used to build the UFW’s new facility to provide services to farmworkers. Though Romero will be the union's first woman president, Huerta was one of the union's co-founders and instrumental to its operations. Along with Chávez, Huerta formed the National Farm Worker Association — which later became the UFW — and was also the union's chief lobbyist and contract negotiator. Huerta negotiated the union’s first bargaining agreement in 1966 and is credited with coining the UFW rallying cry, ¡Sí se puede!, which translates to "Yes we can!" "I am absolutely thrilled to see that we have a woman as the new president of the United Farmworkers," Huerta told NBC News on Tuesday. "About half of the people that work in the fields, maybe 40 percent, are women, often they are not really recognized ... but they are a very, very, very big part not only of the workforce but also of the leadership of United Farmworkers." 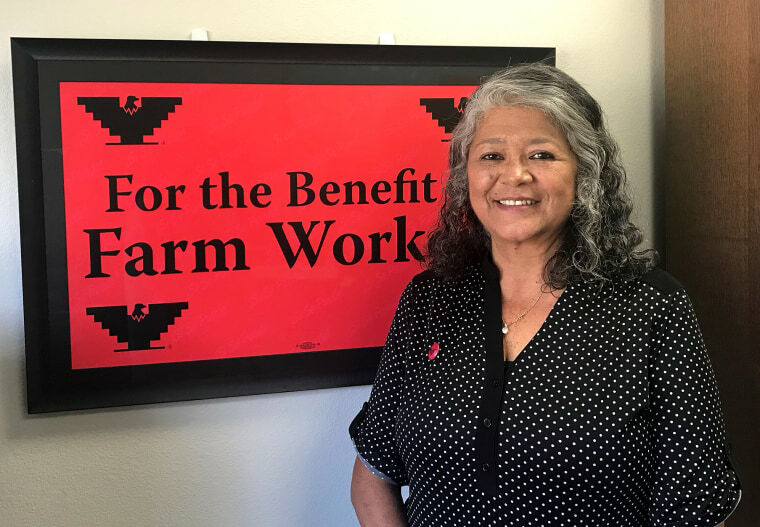 She said the unanimous vote by the UFW executive board to name Romero as the next president is a landmark and historical moment for UFW, farmworkers and the labor movement. "Not just because she's a woman because she's so qualified ... I think they have made a wonderful selection," Huerta said. "I hope the labor movement and the immigrant rights movement that they all celebrate with us."